When boomers were [young], they voted at almost the exact rate that the young do now. 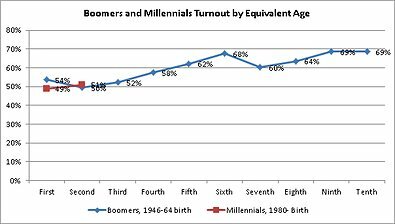 In 1976, when boomers were between 18 and 30 years old, their turnout rate was 50 percent. In 2008, 51 percent of millennials — ages 18 to 28 at the time — voted. And in 1972, when boomers had many incentives to go to the polls, including the Vietnam-era draft, the numbers still weren’t too different. A total of 54 percent of boomers voted in the Nixon-McGovern election, versus 49 percent of millennials in the 2004 Bush-Kerry race. Even Peter Levine, an expert on young American voting patterns who compiled these statistics at my request, was surprised at the results he produced.“I would have guessed there’s more of a youth voting problem today,” he said. As the director of the Center for Information and Research on Civic Learning and Engagement, a nonpartisan research institute based at Tufts University, he specializes in civic issues affecting young people. This entry was posted on Monday, October 29th, 2012 at 5:22 pm	and is filed under Youth Voting/Political Participation. You can follow any responses to this entry through the RSS 2.0 feed. Both comments and pings are currently closed. Really fascinating information. In looking at the years of the first presidential election, in 1972 young people had the option of voting for George McGovern, clearly a candidate whose message resonated with that age group. By 1976, there was probably less enthusiasm for a Carter/Ford election. In 2004, Kerry was perhaps a less inspiring candidate against an incumbent president. By 2008, Obama was successful in providing young people with a message that resonated. This data suggests the importance of the message for increasing youth turnout. I wonder what 2012 will look like on this chart, when neither candidate has given young people a real message worthy of their support. I would be curious to see if there is a similar result in off year elections.